When most of us think of going out to groove to some music with a few friends and a few more drinks at Hauz Khas Village, the image of a crowded, sweaty, stampede oriented and alcohol fuelled riot playing the Top 30’s comes to mind. I’m happy to say that most definitely was NOT the case last Sunday. 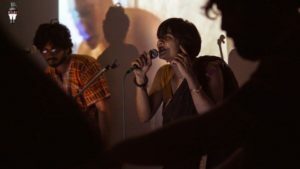 A New Delhi based music collective REProduce Artists brought the Listening Room to a creative space called Bedlam in the far end of the village past all those late night food stalls. 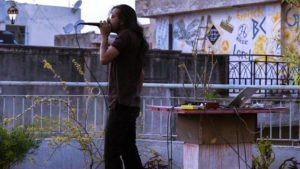 Bedlam is a pocket of originality in the continuous drone of repeats and annoying people shouting offers at you on the street that has become Hauz Khas Village. It serves as a home to A Little Anarky Films which is a collection of creative and innovative individuals who make great video content for all those out there looking to step out of the box and into a cool refreshing pool! Their focus is purely on the live music being cultivated and shared in India that wouldn’t adapt well in the more mainstream oriented venues. Giving off a no-holds-bar vibe, you never really know what to expect when an artist takes the stage. 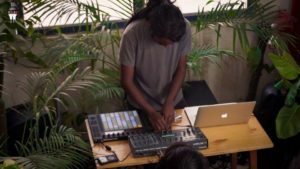 This time around they were showcasing a few debuts of Delhi based artists with a few more from Jaipur, Bangalore and Patiala. The venue allowed for 2 stages, one up on the roof/terrace and one inside of the studio. The artists that were performing were, MC Manmeet Kaur x Smooth Relax (New Delhi, India), Kalab (Jaipur, India), Colorblind (New Delhi, India), Siddh (New Delhi, India), Corridors (New Delhi, India), Antriksh Bali (New Delhi, India), Infinite Jar Space (Patiala, India) and Rogue Atari (Bangalore, India). 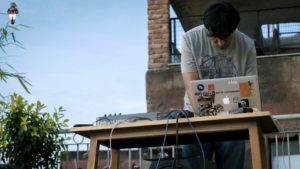 Check out this video of Rogue Atari, an artist who simultaneously paints while he is performing. If you haven’t heard of Bedlam- they facilitate workshops, seminars, mixers, screenings, showcases, collaborative shows etc. So whether you’re a writer, producer, director, illustrator, graphics artist, musician, cinematographer, or just anyone with an idea that they want to breathe life into, you can find people to collaborate and engage with at Bedlam. 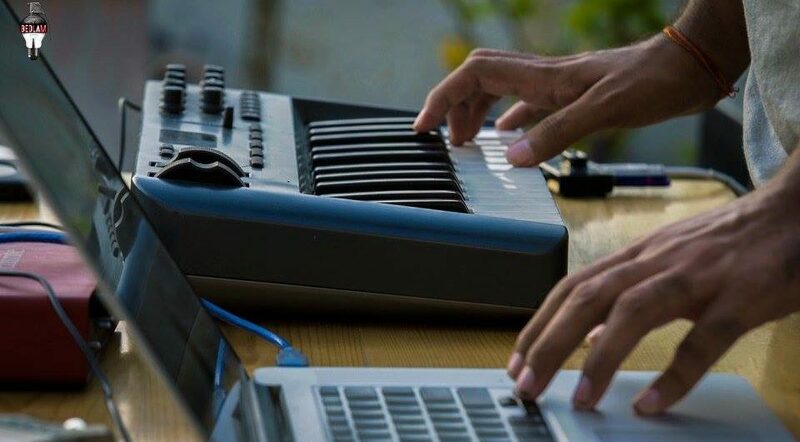 The goal is to unite, to let your ideas run loose, create. A Little Anarky is an integrated content house founded with a vision to create a disruptive mode of storytelling. We are a team of over 25 young filmmakers, writers, designers, strategists, animators, marketers and social media experts who work together to create the best possible visual content, and we have a great time doing that. A collaboration like this was just the cool drink of water the city needed, or beer in this case (it’s BYOB btw!). We’re looking forward to the next session, music lovers of all sorts should be too! Their next event is on the 2nd of April in Sainik Farm, you can visit the page here and keep up with their activities on their public group. If you are looking to find more events that we’ve covered check these out.